The BCW TT Floodcoat is a premium thermal transfer paper facestock that offers high print quality and abrasion resistance for indoor industrial applications up to 6 inches per second. It offers adhesion in a wide temperature range covering corrugated, paper, metals and plastics. 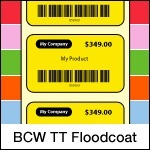 The BCW TT Floodcoat is recommended for applications that do not require durability against water, heat, and humidity. Use with BCW Wax or Wax/Resin Ribbon. 2.00" x 1.00" thermal transfer floodcoat paper label on a 1" x 4" core. 1400 labels per roll / 8 rolls per case. Special features - Perforated. Use with BCW Wax or Wax/Resin Ribbon. 2.25" x 1.25" thermal transfer floodcoat paper label on a 1" x 4" core. 1100 labels per roll / 8 rolls per case. Special features - Perforated. Use with BCW Wax or Wax/Resin Ribbon. 3.00" x 1.00" thermal transfer floodcoat paper label on a 1" x 4" core. 1400 labels per roll / 8 rolls per case. Special features - Perforated. Use with BCW Wax or Wax/Resin Ribbon. 3.00" x 2.00" thermal transfer floodcoat paper label on a 1" x 4" core. 725 labels per roll / 8 rolls per case. Special features - Perforated. Use with BCW Wax or Wax/Resin Ribbon. 4.00" x 1.00" thermal transfer floodcoat paper label on a 1" x 4" core. 1400 labels per roll / 8 rolls per case. Special features - Perforated. Use with BCW Wax or Wax/Resin Ribbon. 4.00" x 2.00" thermal transfer floodcoat paper label on a 1" x 4" core. 725 labels per roll / 8 rolls per case. Special features - Perforated. Use with BCW Wax or Wax/Resin Ribbon. 4.00" x 3.00" thermal transfer floodcoat paper label on a 1" x 4" core. 500 labels per roll / 8 rolls per case. Special features - Perforated. Use with BCW Wax or Wax/Resin Ribbon. 4.00" x 6.00" thermal transfer floodcoat paper label on a 1" x 4" core. 250 labels per roll / 8 rolls per case. Special features - Perforated. Use with BCW Wax or Wax/Resin Ribbon. 4.00" x 6.50" thermal transfer floodcoat paper label on a 1" x 4" core. 225 labels per roll / 8 rolls per case. Special features - Perforated. Use with BCW Wax or Wax/Resin Ribbon.